Fall is nearly here and it’s a fly-fishing vacation as I buckle up in the 2018 Expedition (https://www.ford.ca/suvs/expedition/models/platinum/) from Ford. As we drove to our destination I turned on the back massager, rock and roll music is playing while we enjoy this sunny day. On highway 50, the ride is complemented with lots of wildlife wandering on or alongside the highway and all the way to Montebello even while trekking the back roads. This hot climate didn’t invite the rainbow trout to stay close to the top, having all of the right gear made fishing a great fun day. Fishing had been a part of my family activities decades ago, now with the many years of city living, I’ve gotten back to my roots and I’m beginning to enjoy nature’s best remedy. 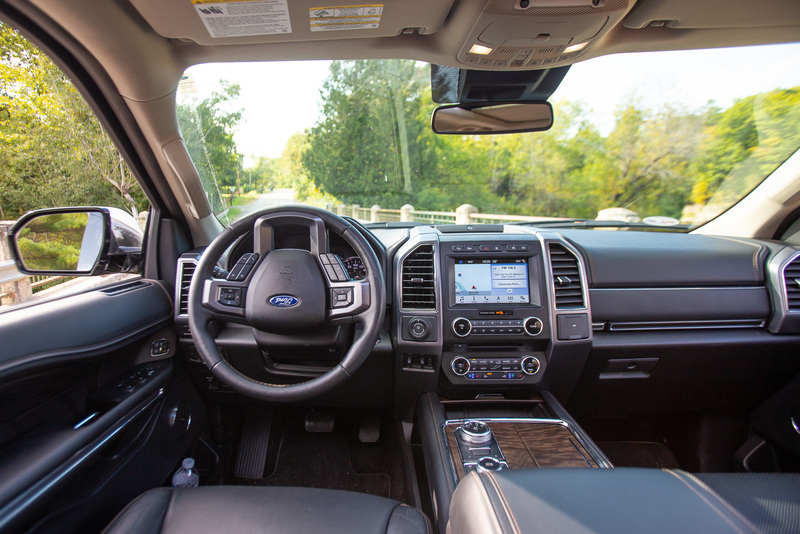 Filling the 2018 Ford Expedition for this angling excursion was stress-free with the added leg space, accommodating 6 guests and myself with open space amongst the seats to fit the fly-fishing rods, gears and a cool box filled with food and drinks. I love the trailer assist, it’s built in with sensors to distinguish a label that you stick on your trailer’s hitch, and the devices will scan the movement and path of the truck so you don’t end up jackknifing! Our guide was Jamie Pistilli, a world-renowned fishing guide, TV personality, and all-around wonderful individual to educate us on specific tricks into this fly-fishing world. Can you see Jamie as he arrives to meet us on the boat? His fishing line is dragging on top of the water? Yes, and of course lucky Jamie hooked for us our first rainbow trout, just like that. 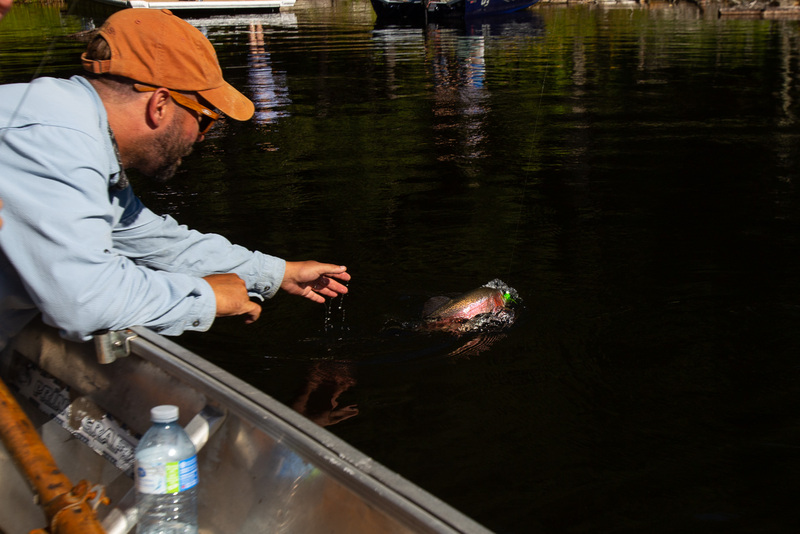 While I struggled to get that rainbow trout out of the water for my first catch this year… yes, the first of 3. First attempt was unsuccessful, so was the second and the third lol at least the third time we got the trout close to the boat, she jumped out of the water and unhooked itself. Fly-fishing has various rules and guidelines particularly in protected lands like Kenouk Nature (http://kenauk.com) as you can fish here, it is a catch and releases rule for everyone fishing on these specific lakes while caring for the future of the fish farm! Your fly hook cannot have the petite hook at the top; it helps to safely disengage the hook from the mouth of the trout with no damage done to it. Now mine all got away even had an exciting time doing so. With the ladies in the boat meant some great fishing stories, like here, Andrea is filling Sandi with her big fish that just jumped out of the water. I don’t think Sandi is buying it! Filled up the trucks after our friend Andrea pulled the one lone, single fish into the boat, but the stories, the laughter, and fun we had on this incredible day on Twin Lake with our tour guide Jamie and the gang. Our friends on the other boat also had some luck adding an additional single rainbow to the daily tally. Making our way to Chateau Montebello for a dinner after a fab day on the water, we’re all beaming, excited to be back in the drivers seat of the 2018 Ford Expedition as we trek alongside these dirt roads, rocky areas and tight curves while enjoying mother natures work as the leaves are first to advance into their fall foliage. The Chateau Montebello (https://www.fairmont.com/montebello/) offered us a great evening on their open-air patio but not before I tried the park assist on the Ford Expedition. I’ve never realized how useful the park assist was, once the turn signal is activated, It began looking for a parking space alongside the street, once the parking assist located one that fit the size of my Expedition a memo emerged indicating the size of the parking space to the ratio for the truck is perfect. As you do for typical parallel parking, lining the vehicles and activating the parking assist to on, while keeping your foot lightly on your brakes, it will park itself while safely fitting the Expedition in tight areas. With the help of your rear camera, you’ll be parking with ease and again don’t forget you are in control of the breaks only, the steering wheel will turn automatically to park you perfectly. After our feast, we sat around the campfire, wide-ranging country music next to us as we talked on this great day from getting paired up, our pros and cons of this vehicle and all the giggles we had today, it made it a fabulous day with some new and old friends. -Transmission 10 speed automatic with select shift capability. On different social media platforms, my name is Roland Bast, my home-base has been Ottawa, Canada during the last 10 years. In 2018 I’ve worked or collaborated with many great clients, including Chateau Fairmont Laurier, Chateau Fairmont Montebello, GMC Canada, content creator for Homme Magazine (quarterly) Parc Omega, Tourism Outaouais, previous year I’ve had the pleasure to collaborate on campaigns for Lexus Canada, GMC Canada, Canadian Geographic: Lac Beauport Quebec, Canadian Geographic: James Bay, Andaz Hotel Ottawa, MëNa restaurant, Le Pois Penché French Brasserie, ATMA restaurant, Homme Magazine, The Westin Hotel. As my other social media platforms attain the largest of my consumer reach, currently the phase to grow as arrived and Fall 2017 I added blogging. While I’m appreciating each occasion that I acquire to trek around the world with diverse cultures that enrich my living experiences. Let’s travel and explore the world together. Disclosure: Sporadically, I accept gifts, accept travel vouchers, also included: great eatery and hotel experiences and additional events that I consider being appropriate to share with my supporters while assisting them in making a great decision on happenings. Look for the word #sponsored on my blog and Instagram posts. My criticisms, suggestions and my experiences are authentic, reliable and composed to advantage you the consumer while trying to experiences similar events that I’ve experienced.